The Acropolis Museum is an archaeological museum that is in Athens, Greece. 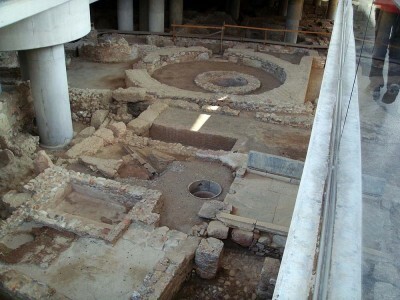 The museum features many ancient artifacts that have been discovered at the Acropolis site. The artifacts are from the Greek Bronze Age, Roman Era, and Byzantine Greece. The museum is also near the Makrygianni architectural site. There are nearly four thousand objects on exhibit. This interesting museum offers visitors all of the essential amenities that are expected from a twenty-first century international museum. The first Acropolis museum was completed in the 1870’s. The structure experienced renovations along with expansions over time. Several excavations throughout the years discovered numerous new artifacts but they could not be put on display because the museum was too small. Another reason that the new museum was needed was the Greek government had requested that the United Kingdom to return the Elgin Marbles. Development of a gallery to exhibit the Elgin Marbles was an important factor in the new museum’s design. The new museum opened in June of 2009. It has a modern design which was created by Bernard Tschumi, a Swiss architect. It was built on a number of pillars so it could preserve the archaeological site that was uncovered below its foundation. There is a glass floor that gives visitors a glimpse of several excavated remains of ancient houses. The museum has tall glass facades on every side, so visitors can see the Acropolis while they are inside the museum. Today, this museum is 26,900 square feet in size and has over 15,000 square feet of exhibition space. This makes it ten times larger than the old museum. The museum has a virtual theater, an amphitheater, and a temporary exhibition hall. Visitors can enjoy both orchestral and contemporary music events that are performed in the courtyard area. The Acropolis Museum also offers gallery talks about selected exhibits. On the weekends, the museum has video screenings about the monuments of the Acropolis in their theater. There is a cafe on the ground floor and a restaurant on the second floor that has panoramic views of the area. There is a book and gift shop on the second floor. The museum is open late on Fridays, and so is the restaurant which serves a dinner special menu on that day. The Acropolis Museum collection features sculptures that have been discovered in the Acropolis area. Visitors first start out by walking up a ramp. This is to represent the ascension of Acropolis Hill. Ancient daily life objects are displayed on each side of the ramp. The first gallery has many archaic statues that date back to the fifth and sixth centuries BC. The Moschophoros, or calf bearer, is a very famous statue on site that was created in 570 BC. It represents Rombos who is planning to sacrifice a young calf. The center of this gallery displays the Boy of Kritios statue, and it represents the change from archaic artworks to classical artworks. There is also a wonderful relief of the young, mourning goddess, named Athena. The next floor displays the reliefs and sculptures from the Parthenon. A large relief of the Parthenon frieze is shown on this floor. It is over one hundred and sixty meters long. There are over six hundred figures depicted in this frieze. It shows a Panathenaic festival that was held to honor the goddess Athena. The reliefs are exhibited in the exact order as they were once shown on the Parthenon. Many metopes are also displayed, which are relief sculptures that were created for the exterior of the Parthenon. The last gallery exhibits parts of the Propylaea, and the Athena Nike temple. Additionally, the sections of the Erechtheion are displayed that include the Caryatid sculptures, which supported the structure’s south porch area. Visitors can watch conservators perform restoration work on the Caryatids. On the third floor, there is an outdoor terrace that provides a wonderful view of the area. Most of the original Parthenon statues, which are called the Elgin Marbles, can be viewed at London’s British Museum. Great Britain’s ambassador to the Ottoman Empire had acquired authorization from Ottoman rulers to take many of the Parthenon sculptures to England in 1799. In 1816, the marble sculptures were sold to the government of Great Britain and were exhibited at the British Museum where they still remain. The Greek government views the transaction as invalid, and has actually demanded the return of the ancient sculptures. In fact, the new museum was constructed in part to show that Greece is very capable of protecting the priceless marble sculpture collection. It is interesting to note that visitors are not allowed to photograph sculptures at the Acropolis Museum, but there is no photo restriction at the British Museum.